It can be a wonderful bonding experience to take a car ride with your dog, but you want to make sure that your seats are protected as well. Dogs have long claws that can tear up upholstery, not to mention the fact that they spread hair and other stuff everywhere when they ride in your car. But you can keep your car cleaner and prevent wear and tear on your upholstery and other components with a dog car seat cover. In this guide, we will look at five of the most popular dog car seat covers on the market as well as help you decide on how to choose one by covering everything that you need to know in a handy buying guide. If you want to get a great dog car seat cover, then any of these five are going to serve your purpose just fine. These are five of the most popular and highest quality dog car seat covers on the market, encompassing both a great deal and a fully featured product. Let’s take a look at each of them one by one. This luxury pet car seat cover from Barksbar is the best way to keep the backseat of your car protected from scratches, dog for and anything else that happens. When you have a heavy-duty pet car seat cover, you can take your pet with you everywhere you go and have no worries that your car is going to get torn up. But this pet car cover takes things a step further by providing a luxury experience for your pet while he or she is writing with you using some of the most durable and comfortable materials possible. The first advantage that the seat cover has over some of the others on the market is that it is made with a color-fast material that prevents bleeding onto the seats. When you use a pet car seat cover in a vehicle where the temperature can rise to well over 100, you can sometimes get a transfer of dyes onto things like a dog seat belt, dog harness or even the dog collar. But mostly this happens onto the car upholstery itself. This is especially true if it is cream-colored or some other very light color. But this car seat cover doesn’t have that problem. 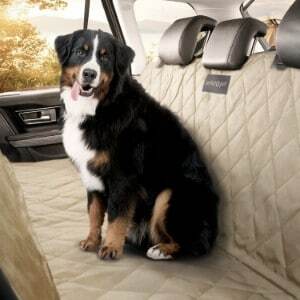 It is one of the best dog car seat covers specifically because it is made from such high-quality materials. It’s free of AZO dyes and heavy metals as well, both of which can be detrimental to your pet’s health. Some of the features that make this car seat cover great is a quilting pattern that looks terrific with any upholstery, heavy duty and waterproof triple layered material, anchors and buckles to keep the seat cover in place even while your dog is moving around, side extensions to protect the very edges of the seat and simple conversion between a bench style car seat cover and a hammock which your dog may prefer. Best of all, this car seat cover will fit just about any bench seat because the buckles and clips make it adjustable so that it can be stretched out easily. 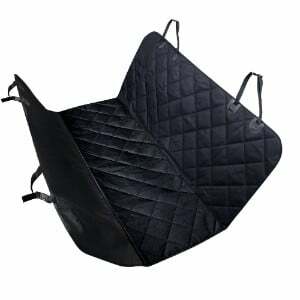 From Perfect Pet, this seat cover is going to give you a great deal of peace of mind when it comes to taking your pet on car rides. With a cream color and quilted pattern, this will fit just about any car and still look as if it were made for it, matching the most common upholstery and fixture color of the vehicles on the market in the United States. Not only is this a really attractive dog car seat cover, it is also one of the essential tools that you need for a dog, just as important as a dog bed, dog house, dog bowl or automatic dog feeder and dog food in a dog food container. Just like an indestructible dog bed, car pet seat covers are made from really strong materials and able to stand up to many years of use. This car seat cover is specifically designed to prevent the tearing and scratching that comes from dog claws, so even if your dog hasn’t had his claws trimmed, this car seat cover will still protect your upholstery. It is also waterproof, so if your dog has an accident or drools on the cover it will not leak through to your vehicles upholstery, and it has rubber nonslip backing that prevents it from being moved around. This is also an exceptionally easy to install pet car seat cover. Some of the features that you will love include the quality quilted material which is thick enough to prevent damage to your car, plus a blend of Oxford fabric, polyester and cotton that makes it comfortable for your pet sit on, waterproofing and nonslip features, installation using the seatbelt anchors and Velcro closures, as well as perfectly fitted and reinforced headrest straps. Plus, this car seat cover is easy to clean with a damp cloth or vacuum. Another great dog car seat cover is this one from URPOWER. It is one of the most versatile pet car seat covers out there. 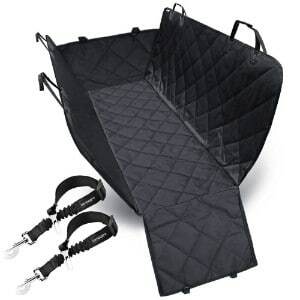 This can be combined with cooling pads for dogs or interactive dog toys because it is versatile enough to fit even when you lay out your backseat flat which some people prefer to do when they are transporting their pet. This is a hammock style car seat cover, so it protects your vehicle on both sides and allows you to put your pet right in the middle and prevent any accidents on both the seat that your dog is sitting on and the backs of the front seats as well. In addition, the hammock design gives dog security and prevents them from leaping over the seat when you’re trying to drive. This car seat cover is mostly quilted gray, but the protection against the back of your front bucket seats is heavy interwoven nylon that is been coated to prevent scratching. This hammock cover has a lot of advantages over most of the covers on the market. For one thing, it provides side flaps that hang down out of the car door so that you can easily load your dog without having to worry about scratching the sides of your bench seat in the back or them struggling to get up into the car. The side flaps not only provide traction for your dog, but they also provide protection. This car seat cover also has a nonslip surface and it is perfectly safe for your dog containing no chemicals or other construction additives that could make them sick. It is versatile enough to be used as a full bench seat cover, or to be converted into a cover for laying down your seat flat and you can even provide a place for your pet and still carry kids in the back of your card thanks to the versatile split zipper design. It is the perfect size and style to fit the maximum number of vehicles and it is almost certain to fit yours as well. The second BarksBar car seat cover on this list is also a terrific choice. This is also a hammock style car seat cover, but it is so incredibly easy to set up that you can have it installed in just seconds. Each of your car headrests will have a strap around it that keeps the car seat cover in place. It creates a perfect pocket in your backseat that will keep even a large dog secure and prevent them from jumping over the side of the seat to interfere with your driving. All you have to do to set it up is slide it into place and then loop the straps around the headrests. There are further anchors that you can use to keep it from moving around, but basic setup is a snap. However, even though this is primarily a hammock style car seat cover, it is versatile enough to be converted into a normal bench seat cover if you want. There are built-in Velcro openings for your seatbelts as well as further seat anchors to keep it from sliding around. It is also made of heavy-duty polyester that is both comfortable and durable, and is completely waterproof in case of an accident or dog drool everywhere. It is also simple to clean. All you do is use a wet cloth or bucket of soapy water and your car seat cover will be clean and seconds. Obviously, you want to remove it from the car before you clean it though. 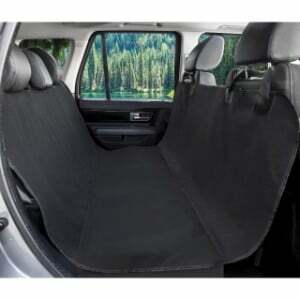 This car seat cover measures 54 inches by 58 inches and it is designed for backseats of any standard car, truck or SUV. There are seven inside flap extensions if you want to use them, but if you don’t need them they are detachable so they get out of the way. Like other BarksBar products they are made with the colorfast material to prevent color bleeding onto your upholstery and they are totally free of arsenic, lead and mercury so even at extremely high temperatures this car seat cover is perfectly safe for both your dog and your car. URPOWER also makes the last car seat cover on the list. Instead of transporting your dog in a dog crate, get this car seat cover. This car seat cover features a fourfold reinforced design made out of extremely durable oxford cloth as well as cotton and waterproof polyester. The PVC net keeps the seat cover from moving around even on the most slippery seats and prevents your dog from feeling as if he’s on slippery ground. When it comes to protecting your vehicles upholstery and making sure that your car retains its value, there is no better solution than this dog car seat cover. 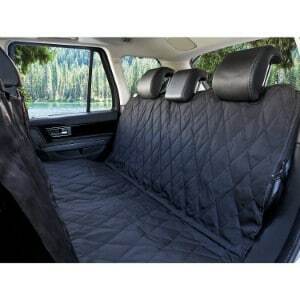 The material that is next to your vehicle seat covers is soft enough to prevent any damage to your sensitive upholstery, the design is perfect for bench seats, covering every single nook and cranny so even if your dog has an accident in the back of your car, you can clean it up without having to worry about your vehicle becoming damaged, plus, mud, dog hair, dander and all of the other things that your dog tracks into your car will go no further than the seat cover and you can clean it easily with just some soapy water and a wash cloth or sponge. This is also a seat cover that is really easy to install. You can decide whether to install it as a hammock or whether you want to do a standard bench seat cover. Quick release clips allow you to pull in and out fast, and seat anchors can be inserted into the crevices to fasten the cover properly and prevent leakage in case of an accident. In addition, there are several sets of adjustable plastic clips that can attach around the headrests and other places in your car. There are a lot of different factors to keep in mind when you are buying a car seat cover for your dog. In fact, most people do not realize just what goes into choosing the right car seat cover. However, in this buying guide we will be looking into everything that you should be aware of when it comes to choosing the right one; from the construction material to the various types of car seat covers out there. There are several different varieties of car seat covers on the market these days. Understanding what the differences are between them will help you choose the best one. Just like an outdoor dog kennel or dog playpen, there are certain primary factors that you will need to be aware of before you can buy the right one. These are the primary factors when it comes to dog seat covers. Before anything else, you’ll want to choose the right type of cover because deciding which one you need usually depends upon your car. The wrong kind of cover may not fit properly. Let’s take a look at each of these one by one. Bench Seat Covers: Bench seat covers are perfect for all kinds of breeds including German Shepherds, Golden Retrievers, Labrador Retrievers and French Bulldogs. Bench seat covers are made for the backseats in your car, and they usually fit just over the backseat, protecting the upholstery on the bottom and the upholstery on the rear, but occasionally also with side flaps that hang down on either side or flaps that hang down on the front to protect that upholstery as well. Some bench seat covers also double as hammocks, and can be changed between the two quite easily. Bucket Seat Covers: Bucket seat covers are car seat covers that use on your front seats. Most people prefer to have their dog ride in the backseat, but for those who want their dogs to write up front, or who are already using the backseat to transport children, a bucket seat cover may be a great solution for some dogs. The problem is, a bucket seat cover doesn’t offer the same kind of protection that a backseat cover can, because it doesn’t cover as much area and cannot be converted into a hammock to prevent your dog from interfering with your driving. However, if you have a well-behaved dog this can be a really good solution. Irregular Seat Covers: Your car may not fit the standard pet covers that are out there. Most of the seat covers that you will come across will say that they are for cars, trucks and SUVs. However, that only covers three types of cars. For example, it doesn’t cover all vans. If you have a type of car that isn’t compatible with the standard seat covers, then you’re going to need an irregular seat cover. These are usually a little bit more expensive, and you often have to buy them online, but you are sure to find something that will fit your car if you look. Dog Hammocks: Dog hammocks have a distinct advantage over all of the other types of car seat covers for dogs that are out there. No matter what kind of dog you have including Pointers, Yorkshire Terriers, Rottweilers, Poodles, Beagles and Bulldogs, they will fit into a hammock. A hammock is one of the best car seat covers for dogs because it offers complete protection for both the backseat itself and the area around the backseat. Plus, because part of the hammock blocks entrance into the front seat, your dog will not try to come up and see you and possibly distract you or interfere with your driving which could cause an accident. When it comes to rear seat covers for pets, hammocks are probably the best option out there. Pet Car Protectors: There are also various types of pet car protectors like car door guards which extend the protection of your car seat cover to protect things like your doors and windows. The problem is, even with a hammock style car seat cover, dogs like to look out the window and put their paws up onto the glass or onto your door. This can damage the window buttons, as well as the upholstery and fixtures that are located there. But car door guards can protect your door and windows and keep your dog from damaging them. Cargo Covers: Finally, cargo covers are a terrific option for people who like to transport their dog in the storage area of their vehicle. For example, if you have a station wagon or an SUV, then you may open up the back and have your dog climb in there. But there are upholstery and fixtures back there as well, and your dog has a lot more freedom in the cargo area because there is more room to walk around and you are not able to issue commands when they start getting into stuff. That’s why it is important to have a car seat cover that fits over your cargo area. Cargo covers come with a protective mat like a standard car seat cover as well as rubber bumper guards and various other protective elements that keep your car from getting damaged. Knowing which brands are the most popular will be helpful when it comes to choosing the right car seat cover for your dog. There are lots of brands out there that make car seat protectors for dogs, but there are only a few that lead the marketplace. Let’s take a look at each of these brands one by one so that you can know what to look for when you start doing your own shopping for a car seat cover. You don’t have to go with one of these brands, but if you do happen to encounter a product made by one of them, you can be sure that it is a top-quality product. BarksBar: BarksBar is the first friend they were going to talk about. These guys have been in business for quite a while and have a really great reputation. They don’t just sell car seat covers; they sell things like orthopedic dog beds, car seat belts and various other accessories. Epica: Epica is another car seat cover to be aware of. The thing that makes them unique is that they have not been around that long, but they have still been able to develop a reputation that is just as impressive as the reputations of the other brands on this list. The other thing that makes this brand unique is that they concentrate on high tech products for pets. They also make some terrific car seat covers. NAC&ZAC: Another great brand is NAC&ZAC. This brand was formed by a group of pet enthusiasts and they concentrate mostly on travel products for dogs. Some of the products that they focus on include car door protectors, hammocks, dog seat belts, seatbelt liners, net barriers and more. Plush Paws: Plush Paws makes some really great pet products as well. The company is only a couple of years old, but they have risen right to the top with a fairly large inventory of pet products including protective kids and cargo liners as well as some of the best car seat covers on the market. They also offer other dog accessories like dog bowls and beds. 4Knines: 4Knines is the company made up of dog owners, and they focus on several different categories of dog products. They have the distinction of having one some really prestigious awards for their products, and they have been around for a while as well and have earned their reputation as one of the top companies when it comes to dog car seat covers. There are various types of materials that are used in the construction of dog car seat covers, and the best dog car seat covers probably have at least three different materials that are used in their construction; possibly more. Dog car seat covers have to stand up to a whole lot of abuse. They have to be able to resist tearing by your dog’s sharp claws, the spilling of liquids if your dog has an accident, pawing and wear and tear as well as biting in some cases. That means that they need to be exceptionally strong and made up of water-resistant materials or completely waterproof. A final consideration is that they need to be comfortable enough for your pet to want to sit on them. Luckily, most of the car seat covers out there do a really good job of this. That’s because of the materials that they are made up of. Two of the most common materials when it comes to dog car seat covers are vinyl and polyester. There both really good choices, although vinyl can still get torn by claws if your dog is really aggressive. Dog car seat covers also incorporate comfort into them, but usually not at the expense of ruggedness and durability. Although there are some car pet seat covers that are made of soft fabric or microfiber suede, usually, dog car seat covers are made of heavy canvas or nylon, sometimes with a coating that protects your car even further. This water-repellent coating means that spills are going to stay in the dog car seat cover and not run off or through to damage your vehicles upholstery. Poly-cotton is another popular seat cover fabric and there may be others as well. Whether you go with the specific material, or you determine which brand or product is the best and worry about materials last is completely up to you. Whether you put your dog in the front seat or the back seat will depend upon several factors. Front seat riding dogs need to be a lot better-behaved than back seat riding dogs. With back seat car seat covers, you can put a barrier in place so that your dog does not try to leap over and lick you or sit in your lap while you are driving. This kind of behavior can cause an accident. Front seat car seat covers usually only cover the seat itself and sometimes the floor underneath. Although they can definitely be helpful when preventing damage from claws or drool, they do not offer the same protection that back seat car seat covers do. Back seat car seat covers can be spread out so that they protect all of the various parts of your back seat, including the rear part of your front seats. They can also be converted into a hammock which has a wall between your dog and the front seat, and prevents them from crawling into that part of the vehicle which is dangerous for both of you. Rear seat covers are usually going to be more expensive, but there are a lot more on the market as well. Of course, there are also various other types of covers that we have discussed such as cargo covers. Car seat cover sizes are just as important as choosing the right style. Although most of the car seat covers on the market these days are made to be universal, there are still going to be some size issues that you should be aware of. For example, some car seat covers will come in small, medium or large sizes depending upon whether you are going to use them in a compact car, a sedan or a larger vehicle like an SUV. You want to be aware of these differences and look for them when you purchase the product. However, even if your car seat cover doesn’t specify a particular size or give you size options, and it appears to be a universal car cover that says it will fit in your vehicle, you still want to do your research on it because not all of them fit. The problem is, there are thousands of different car seats on the market, and car seat cover simply cannot fit to every single one of them. Car seat cover manufacturers do a pretty good job of making sure that their pet seat covers are universal and can fit just about anywhere, but it is recommended that you check out customer reviews on a particular product and find out if anyone has had a problem with it fitting on their particular vehicle. For example, reviews might be able to tell you whether a car seat cover fit well on cars but did not work with trucks. A few other factors to consider when it comes to choosing the right back seat cover or front seat cover for your dog include whether or not the car seat cover is waterproof. Purchasing a waterproof cover is important because dogs drool everywhere and they get it all over your car. Usually, this isn’t going to be a problem even if the car cover isn’t waterproof, but occasionally some can get through in onto the upholstery. The real reason you need waterproofing is in case your dog has an accident on the backseat. Dogs that are frightened or startled could urinate and that will soak through car seat covers that are not waterproof and end up making your upholstery smell. Even if your dog is perfectly potty trained, you should still get a waterproof cover just in case. Another important thing to consider is how you are going to clean the car seat cover. Some car seat covers are machine washable. That means that you can just put them in your washing machine and clean them and then they will be as good as new. However, most are not like that. Most are made of rougher materials that are not going to stand up well to being washed in the washing machine. In the cases of these covers, you can usually just take soap and water and scrub them down. You can also clean dog car seat covers by vacuuming the dog hair off of them in some cases. Finally, make sure that you know what kind of warranty comes with your dog seat cover. A vehicle seat cover needs to be able to stand up to a great deal of damage and wear and tear. That means that your seat cover should include some sort of warranty that will allow you to replace it if it is not as strong and durable as the product listing claims. These warranties are usually not for very long, but they are important to look for the longest one that you can. The bottom line is there are a lot of things that you need to consider when it comes to choosing the perfect car seat protector for dogs. When it comes to dog cover for car, you definitely want to look at the materials, the waterproofing ability, the size and the fit of the seat cover, how well it is secured to the backseat, whether it converts into a hammock and a whole lot more. You want to be aware of whether or not the seat cover can be cleaned easily, and you should know some of the brands that are out there see can make a better choice on which ones to buy. A dog seat cover can be one of the best investments you can make because it protects your car which is already a major investment. This buying guide should give you some great advice and lots of different options.